funny, that i found my intro on this intro-collection-site. the idea behind this intro was, to create a really small one, but including nice effects as well. 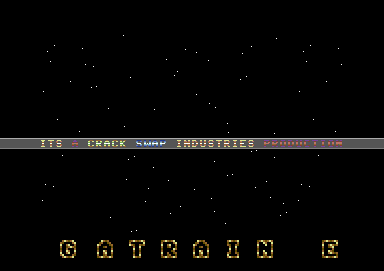 so i made this intro without graphic data (no big logo - only the small textline in the middle) - but with a multi-speed-star-scroller in the back an a funny bordersprite-scroller with a generated(!) font. the font is calculated out of the normal c-64 kernel-font, so no image-data is needed in the source, which saved a lot of bytes. with this tricks, the whole intro was only 3 or 4 kb in size (including scrolltext! ).